1) In which I interview my 7-year-old self, my 14-year-old self, and my 20-year-old self… and it turns into a tense and uncomfortable conversation about our differing perspectives. 2) Some reflections on just how meaningful this movie can be for us right now. 3) What some of my favorite film reviewers are saying about Boyhood. Jeffrey Today: So, guys… you’ve just seen Boyhood. Before we get started, do you have any questions? Little Jeff (7 years old): How did that kid get older while we were watching the movie? Teen Jeff (14 years old): It took them 12 years to make the movie! Everybody in the movie got a lot older. That was obvious. Even the grownups… they started pretty old, and got really old. Jeffrey Today: They didn’t get really old. They just got, you know, up into their 40s. Like me. Little Jeff: Why aren’t Mason’s mom and dad together? And why are they always fighting? Jeffrey Today: That’s one of the things I want to talk about. Let’s sum up: We watch Mason (played by young Ellar Coltrane) and his sister Samantha (played by the director’s daughter Lorelei Linklater) grow up under the care of their loving but overworked mother Olivia (Patricia Arquette). Their dad, Mason Sr. (Ethan Hawke), comes to visit sometimes. We’ll talk about the actors later. First, let’s talk about this family. Mason Jr. and Samantha have a challenging life, a mix of blessings and hardships. What do they have going for them? What are their biggest challenges? 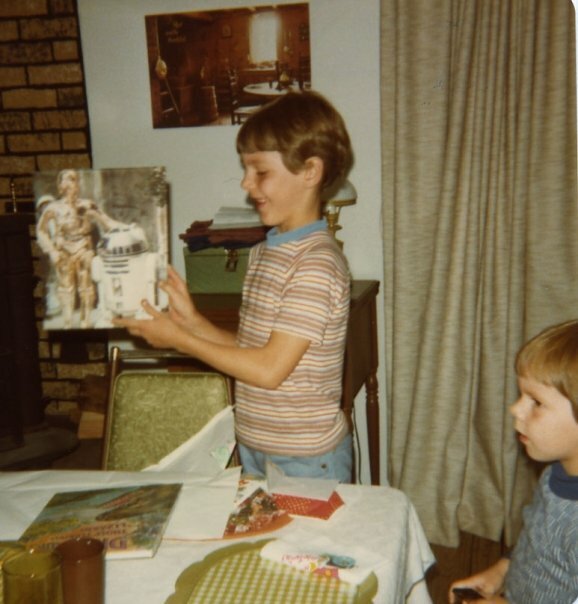 Jeffrey Overstreet at 7 years old, admiring a new Star Wars folder for school. Teen Jeff: Mason and Samantha seem like a real brother and sister. They fight sometimes, but they like each other. Jeffrey Today: Definitely one of the most believable sibling relationships I’ve seen at the movies. Little Jeff: Their mom is really strict. Jeffrey Today: Olivia is strict, yes, but she’s raising them on her own. She has to be careful, right? Don’t you think it’s obvious how much she loves them? Jeffrey Today: You mean, that super-cool black GTO that he loves? He’s pretty proud of that thing. YA Jeff: Exactly. But then, he admits that he might not even have seatbelts for his kids to use. That’s, like, a summary of his whole life and personality. He wants to be cool and reckless and free — and be a good dad — but he can’t, because he’s self-absorbed. He just wants everybody to like him. He doesn’t do what a good parent does. He and Olivia just weren’t mature enough to be together and start having kids. Jeffrey Today: Wow, that’s a heavy judgment there, bucko. You sound awfully sure of yourself. You’re 20 years old, and you’re already planning to propose to a certain young woman. Are you ready for marriage? YA Jeff: I think so. Jeffrey Today: It would be easy to focus on pointing out who in Boyhood lives up to our standards of being “good” or “bad.” But that would miss the whole point. Boyhood doesn’t exist for us to cast judgment over the people we see. It’s a picture of one particular family that can help us see ourselves more clearly. They make choices, they make mistakes, they grow, they change, they try to do better. Maybe we’ll find new perspective on our own childhoods, or our own adulthood. This film shows just what a huge responsibility it is to be a parent. Sure, it’s a celebration of boyhood, yes, but it is also a lament. The pain in this movie rings very true, as if it’s a very personal story for Linklater. Look at Mason Sr. and Olivia — they’re so much like so many American parents, failing each other but still trying to be good role models for their kids. It’s so easy to make promises in a rush of idealism and affection, dazzled by each other’s goodness. But it’s hard to keep those promises when the New becomes Familiar, and when we have to learn to live with each other’s weaknesses. That’s what love requires. And when we abandon love — thinking that we’re doing ourselves a favor — we end up doing incredible damage to our families and ourselves. There’s conviction and authenticity in every glimpse of the damage in Mason’s family. YA Jeff: Well, they should’ve known better. Jeffrey Today: Young Adult Jeff, you’re young and passionate and full of zeal. You feel ready for marriage. You might even be ready for marriage. But college years are a time when a lot of things change very quickly. It takes two extraordinary individuals to stay together through that time of self-discovery. Mason’s parents failed — sure, no doubt about it. But you, Young Adult Jeff, should be careful about being quick to judge. You have a lot of failures ahead of you as well. Life will teach you to be a little more humble and compassionate in time. YA Jeff: What are you talking about? Jeffrey Today: Never mind. Just… you’ll see. Little Jeff: I liked the parts with the kids best. Jeffrey Today: The childhood scenes are often very joyful, because young Mason Jr. is making so many discoveries. He’s full of questions and playfulness and wonder, and he’s so often disappointed. That’s part of what makes the movie so painful. It’s a relief to see him go camping with his dad and having a good time. I suspect that moviegoers will have very different opinions about which part of this movie work best, because they bring very different experiences to the theater with them. Some things will feel familiar, some things will seem strange. The Jeffrey Overstreet experience is very, very different from the Mason Jr. experience. Mom and Dad got married young, but they’re still together almost 50 years later, and a great example of faithfulness and love. They’ve been trustworthy for each other and for me and my brother. That’s a rare and amazing gift, and I’m grateful for it. Teen Jeff: That made me feel very sad for Mason Jr. and Samantha all the way through. They don’t have very good examples of how to be a grownup. Jeffrey Today: True, but I find myself hoping they will learn from their parents’ successes and their mistakes. Maybe they’ll learn to value something more than their own immediate happiness. 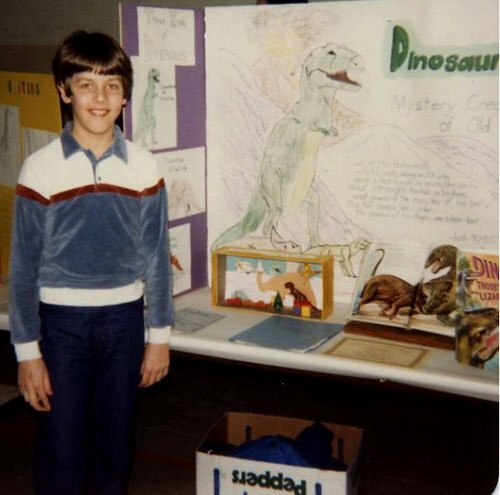 12-year-old Jeff with his 6th grade science project. Teen Jeff: I liked Mason Jr’s mom when she protected him from the guy who drank too much. But I wish she hadn’t gotten together with that guy in the first place. Jeffrey Today: She was probably lonely. Raising two kids alone is hard work. And it probably felt good to find that someone charismatic and intelligent was interested in her. It’s too bad she leads her kids into a very risky situation. But we can see her growing wiser… little by little. Mason Sr., too, seems to improve in some ways. What happens when you lose your trust in the people who have a responsibility to love you? Teen Jeff: You don’t respect them. You don’t want to live by their rules anymore. If they aren’t responsible, why should you be? YA Jeff: And that’s why Mason Jr. is so rebellious in high school and college, doing lots of dangerous things. Jeffrey Today: I’m sure that’s part of it. But you can’t blame everything on his parents. He bears some responsibility too. Little Jeff: I liked the part where Mason Jr. rides a bike. And the part where he pushes his dad into the lake. That was my favorite. And he has a cool camera. Jeffrey Today: Yes, you like the parts where he’s playing and making things and figuring out who he is, rather than focusing on merely surviving. I love watching him discover a passion for photography. And it feels good to see him throw his dad in a lake, doesn’t it? Teen Jeff: I’d rather see him throw his stepdad off a cliff. That guy is really horrible. It’s because he drinks. And later, Mason starts drinking. Jeffrey Today: That stepdad is pretty horrible, you’re right. But is that why Mason Jr. starts drinking? Teen Jeff [thinks for a moment]: No, he drinks because of peer pressure. He’s afraid that the bullies will pick on him if he doesn’t play along. Little Jeff: Drinking is bad for you. Teen Jeff: Drinking isn’t just bad for you. It’s bad for everybody. It makes them violent and mean. Jeffrey Today: Okay, hold on. Being drunk can get a person in trouble. But Mason’s mother drinks too, right? Does that make her a terrible person? Does she become a monster? Little Jeff [looks uncomfortable]: I saw beer bottles on our neighbors’ back porch. That’s why I’m not supposed to talk to them. Jeffrey Today: Well, eventually you’ll learn that some people are wise to stay way from alcohol for their whole lives, while others enjoy it in a good way, and it enriches their lives. Mason Jr. and Samantha and you and me — we have to learn what’s best for us and how to enjoy good things with self-control. Besides, you can be just as terrible by not drinking. I can hear a kind of self-righteousness and condemnation in your voice, Teen Jeff, that surprises me. I’d forgotten how judgmental I was at your age. That kind of attitude will hurt your neighbors and it will ultimately hurt you too. 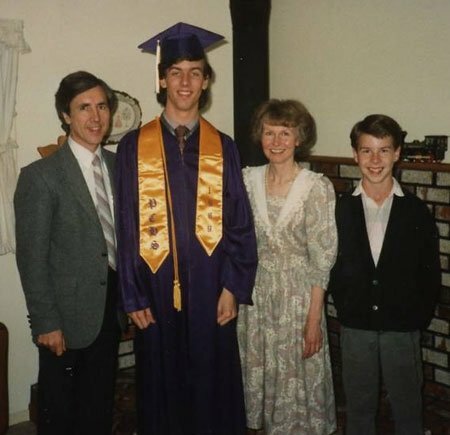 Jeff graduates from high school. Teen Jeff: I think Mason and his family need the Gospel, or they’ll never be happy. They never even talk about it. Jeffrey Today: Kid, I remember your zeal for the Gospel. You’re quite the evangelical. And you’re right — everybody needs the Gospel. YA Jeff: So, you pretty much think it’s a perfect movie then. Jeffrey Today: No, not really. The biggest problem that I have with the story is that Mason Jr. is made to be almost 100% sympathetic. It’s a common experience at the movies — kids are made to seem like the smart ones, and grownups are almost always the irresponsible ones. Like Harry Potter in J. K. Rowling’s novels, Mason Jr. is pretty much always innocent, and everybody around him is responsible for his problems. People love movies that do this, because it means they can come away from the movie feeling smug at how smart they are, and how much the rest of the world is failing. Personally, I wish that we saw Mason making mistakes that have serious consequences. When I think back on my own life, I have no trouble identifying situations where I was very, very wrong. But Mason… he just drifts through one experience after another. Some of his choices and behaviors are more questionable, I think, than the movie suggests. If the movie was more honest about the effects of his own recklessness, it would have felt more true to me. Do you see any weaknesses in Mason’s attitude as he’s growing up? YA Jeff: He suffers because of his parents’ poor judgment with relationships. But he’s very quick to get heavily involved with the first pretty girl who pays close attention to him. So he’ll probably end up in the same mess. Jeffrey Today: He’s definitely carrying on his parents’ impulsiveness. But it’s a very rare young man who has great wisdom and discipline in that department. I wasn’t impulsive and reckless, but I was horribly jealous. I didn’t take rejection well at all. YA Jeff scowls, feeling vaguely criticized by Adult Jeff. Teen Jeff: Mason’s girlfriend is always staring at that cordless phone she’s carrying. He’s kind of mean to her about it. Little Jeff: How does that phone work? It doesn’t even look like a phone. Jeffrey Today: Mason is pretty dismissive about social networking and its advantages. He could probably be less arrogant about it. But is he totally wrong? Isn’t it true that social networking can have a huge influence on our in-person relationships? YA Jeff: I don’t know. Cell phones and the Internet aren’t part of my life yet. I could go on with this rather self-involved conversation, but I don’t want to spoil the movie for you. And, frankly, I’m a little creeped out by talking to younger versions of myself. So, here I’ll offer a few more thoughts, doing my best to preserve the film’s surprises for you.One of the joys of this film — one of 2014’s most original and, for me, affecting motion pictures — is the experience of being surprised by life as it unfolds in ways that even the filmmakers were experiencing. Richard Linklater couldn’t have known how history would develop when he started filming young Ellar Coltrane back at age 7. He had to improvise, to develop one chapter at a time based on how his actors, his opinions, his questions, and his world had changed. So in a way, watching this movie, we’re watching more “real life” than usual. What might audiences have thought of Boyhood if this ambitious filmmaking experiment had opened 25 years ago? We were, then, a population unaccustomed to “celebrating the moments of our lives” in moment-to-moment status updates and photographs with large communities if not the whole world. I suspect it would have been doubly impressive and strange for them than it is for us — to see this boy, Mason Jr., and the actor playing him (Ellar Coltrane), mature scene-to-scene before our eyes from 7 years old to 19, even as the actors playing his family age 12 years age as well. It might have inspired us to go home, open scrapbooks, spread photos out all over the floor, consult our family members and old friends, and start constructing time-lapse expressions of our lives as a work of self-discovery. It might have sparked the invention of Facebook. And that would have been supremely ironic, in a way, because while Boyhood is a provocation toward living more “examined lives,” it is also an exhortation to live as fully in the now as possible, unseparated by screens and distractions and the myriad ways we hide ourselves from the challenges of real human connection. Notice how, even in scenes that have nothing to do with technology, young Mason’s life is powerfully influenced by who has time for him, who listens to him, who really pays attention to him and shows him love. If you looked through my own Internet-posted pictures, records of personal preferences, journal entries, and creative projects that reveal something of who I was, what I thought, what I hated, what I loved, from almost any year of my life, you could get a pretty good sense of what experiences have shaped who I was at any particular point on that timeline, and who I am today. You would find that the greatest blessings have come from the devotion of parents and family members, in-person friendships, and teachers. You would find that I found myself by acting, by making, by asking and wrestling, rather than just consuming. I feel like I am watching Boyhood, as well as Girlhood, and various forms of Adulthood (especially Fatherhood and Motherhood) on social networking platforms all of the time now, browsing personal records to see a fuller picture of my friends and neighbors. Thus, this movie feels more like an inevitable product of its time — a film that captures and sums up a new phenomenon particular to this chapter of history — than some out-of-the-blue vision. But that’s good. We need it, in order to ask (as young Mason Jr. eventually does) which is more important … the life that is happening “in the flesh” around us, within reach, in personal connection, or the world that is available to us on screens, second-hand. In a sense, Mason Jr.’s eventual inclination to unplug and be present with his family and friends is a criticism of all screens, even the one on which he now appears, in favor of personal relationship in the now… a value that Linklater has celebrated before in films as different as Waking Life and The School of Rock, A Scanner Darkly and Before Midnight. What Richard Linklater has done here, drawing (I suspect) from his own experiences, is distill one boy’s growth from elementary school uncertainties to cocksure college-bound young-adulthood. And in doing so he invites us — all of us, men and women, boys and girls, singles and spouses, parents and children — to ask ourselves a world of questions about the forces that have made us (parents, siblings, friends, teachers), the damage we’ve suffered, the glories we’ve seen, the desires and convictions inspired by those experiences, and the grace we offer and receive. And the work of art he has crafted for us reveals, thank God, a family of warts-and-all human beings on the screen. Coltrane does an uncanny job of creating a character who matures convincingly onscreen even as the actor, whose true personality and inclinations remain a mystery to us, matures. But for this viewer, it is the characters around Mason Jr. who are most intriguing. Ethan Hawke (as Mason Sr.) and Patricia Arquette (as Mason Jr.’s mother Olivia) are fantastic, delivering some of their best work as parents who, like most parents, are sometimes fabulous and sometimes complete failures, and I found myself believing in Mason Jr’s sister Samantha (Lorelei Linklater) as much or more than I believed in the boy himself. And all of them give me some insight in the hurts and hopes we’ve sensed in Linklater’s films throughout his impressive career. This is not an autobiographical film, but it’s hard not to keep thinking about what his characterizations here reveal about his own childhood, his own relationships. He is, of course, an artist of particular preoccupations and political inclinations. But, thank goodness, he is also a man more interested in guiding us into questions than presuming to draw conclusions for us. Isn’t this what good therapists do — help people understand their troubles, hurts, hopes, and dreams by digging deep into memory and experience? Boyhood may have a sort of therapeutic influence for viewers — especially young people, as they think about the long-term effects of the characters’ decisions. Most movies give us thrills through the drama of rash decisions and bold action, but we aren’t encouraged to consider the implications of those actions. Boyhood gives you the big picture. Rather than blowing any particularly discomforting moment out of proportion, audiences should step back and acknowledge that Boyhood is astonishing primarily because it is an American movie. The only projects that resemble it in cinema history are Michael Apted’s “Up” documentary series (which tracks the growth of several real people from age 8 to age 56) and Linklater’s own three-part, 27-year “Before” trilogy (also starring Ethan Hawke). The American film industry does not encourage artists to ask questions or make actual art. Linklater may not be much of a visual artist — Boyhood‘s biggest weakness is that its visual appeal lies, primarily, in its subjects rather than its composition — but he has expertly built a career by assembling elements we want to see (big stars, clever hooks, technical experimentation) and then weaving them into unexpectedly challenging tapestries. Audiences continue to line up for his movies, eager to see what they want, but coming away with the kind of Big Questions that they need. Perhaps somebody will someday make a movie that depicts Richard Linklater himself at different points of his artist career. If that ever happens, audiences will be able to track the metamorphosis of one of America’s most significant filmmaking imaginations. Fixating on imperfections while discussing Boyhood would be as petty as criticizing the sculpting of individual stones in a cathedral. The totality matters. Even more important is our recognition that the totality is as fleeting as life. More than a stunt, but it almost didn’t have to be, given how inherently mesmerizing it is to watch a child grow up—for real—within a fictional context. … Linklater wisely opts to focus almost entirely on glancing, offhand moments, which makes his occasional stabs at conventional drama—the abusive drunken stepdad stuff, in particular—seem all the more clumsy and misguided. Like so many of Linklater’s loose-limbed comedies over the years, when it’s on, Boyhood is really on—smart, clear-eyed and laugh-out-loud funny in a way that never feels like someone’s stopping to deliver a zinger. That’s doesn’t erase the stuff that’s hard to explain away as anything but clumsy, no matter how ambitious the project in which it resides. Recognizing that this kind of crazy idea might never be attempted again isn’t the same as wondering if [it] still couldn’t have been done better. The emotional power of Boyhood is cumulative. The tears come with the accrual of years. Boyhood is the essence of life softly played. There is one sense, however, in which this emphasis on the ordinary is a limitation. Aside from his forays into rotoscoping animation (Waking Life, A Scanner Darkly), Linklater has never been a visually distinctive filmmaker. His strengths – and they’re considerable – lie elsewhere. … This isn’t to say Linklater’s technique is incorrect, mind you, just that it didn’t fully stir the cinephile within me. Boyhood is a long film at 164 minutes. Nothing explodes. There’s no villain, no superhero, no mystery to be solved. But it’s compelling, enjoyable, heartbreaking, and, ultimately—well, I hate using the word, but it’s inspiring. Leaving the theater, I felt like I needed to pay closer attention to my own life—to stop and just be. So often at the movies, we see stories that teach us that only the remarkable moments are worth telling. 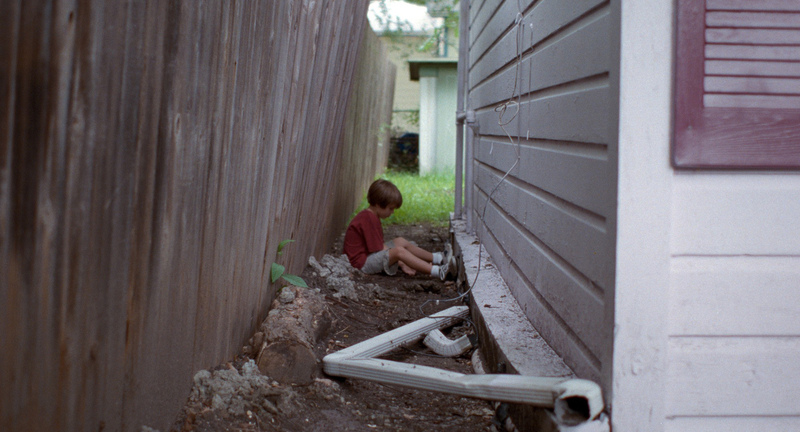 Boyhood is an achievement in filmmaking, and it also does an important, countercultural thing: it reminds us that in the banal moments, the mundane relationships, the ugly rooms and the awkward phases—that is where we live out our lives. But hey, Younger Self, you believe in Jesus… and yet you’re still a mess. You have no room to be so smug and condescending about the state of other people’s hearts. There are still places in our hearts that are broken and flawed. There are still places within us that need love and healing. Those folks you would identify as being on “Team Jesus” — who carry Bibles and pray and go to church and do things in Jesus’s name — many of them show very little evidence that love is humbling them, changing them, transforming them into servants full of grace. Instead, many are self-righteous and judgmental. And those people you have decided are totally “lost”? They’re a mess, too. But Love is pursuing them, working on them, humbling and wrestling with them. Sometimes it’s alive in them in ways that we cannot see or know — even if they don’t give credit to Jesus or use your evangelical vocabulary. When they show love to one another, they are collaborating with Jesus whether they know it or not. We’re told that someday every knee will bow and every tongue confess that Jesus Christ is Lord. Many Christians are very good at confessing, but not so good at showing God’s love through humble action (that’s the bowing part). Others are very good at showing how love is at work in their lives, but they’ve not come to a point of recognizing and confessing Love’s real name yet. So you’ll learn, Younger Self, the world isn’t as black and white as you think it is. You can’t divide people into “the lost” and “the found.” We’re all, moment to moment, hour to hour, year to year, getting lost and finding our way in myriad ways, thanks to God’s relentless grace. Thank goodness, Love never gives up. Would Mason Jr. and his family fix all of their problems if they found Jesus? Probably not. But if you want to find the Gospel in this movie, 7-year-old Jeff, then look for the love. Is Love at work in their lives? Love is Jesus when he’s not wearing his name tag. Great review/interview with yourself. Just FYI, in the eleventh paragraph (Jeffrey Today’s response about the mom being strict) you typed: “she’s raiding them on her own.” I think you meant raising. Ha! Thanks so much for catching that! Of course, in some cases, that mistake wouldn’t have been a big deal. The title RAIDING ARIZONA would have been perfectly appropriate for RAISING ARIZONA.